The Los Angeles County Metropolitan Transportation Authority (Metro) announced a partnership with the San Francisco-based company Getaround to offer an affordable and hassle-free car-sharing service at more than 25 busy Metro transit park-and-ride lots throughout Los Angeles County. 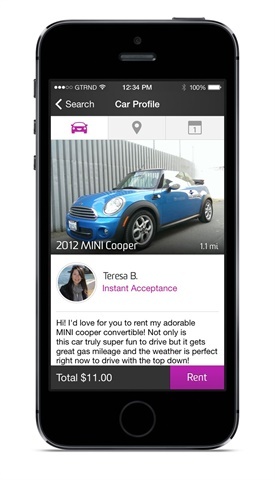 Getaround allows people to instantly rent and drive cars owned by people in their city. The company takes a unique approach to the traditional car-sharing concept by utilizing personally-owned and third-party vehicles. The partnership helps Metro riders and others complete their first- and last-mile connections. Getaround is licensed to occupy 110 car-share parking spaces at 27 Metro transit station lots. Locations were carefully chosen to prioritize equability for communities that need affordable car-share services. All cars shared on Getaround are equipped with the company’s patented integrated hardware and software solution, Getaround Connect™. The device allows users to instantly book, locate, and unlock the car through the app, eliminating the reliance on a physical exchange of keys between owner and renter. The Getaround mobile application is available on both iPhone and Android platforms. “Our partnership with Getaround for station-based car-sharing is our latest effort to improve our customers’ mobility and speed their access to local destinations,” said Metro CEO Phillip A. Washington. Metro is also piloting additional ride-sharing initiatives through its Office of Extraordinary Innovation. The agency recently launched a partnership with Via to offer shared, on-demand rides to and from three stations. It has also implemented bike-sharing in downtown Los Angeles, San Pedro and Venice, with plans to soon expand its bike share network to the Central downtown L.A. and West L.A. area.